Which is the best King Kong Film? There has... in fact been several films made about the loveable furry monster, who wreaked havoc on New York City. 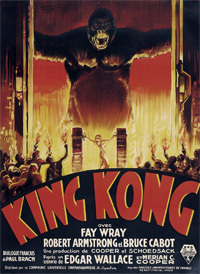 In the 1930’s, there were two films released, King Kong starring Canadian-born Fay Wray, Bruce Cabot and Robert Armstrong, with the story following Carl Denham, who needed to finish his movie and had found the perfect location; Skull island, and whilst on location had managed to capture a mighty ape, return to New York and watched in disbelief as it fell to its death from the top of the Empire State Building, whilst the sequel, The Son of Kong, saw Carl leave New York aboard a ship to escape all the trouble that had been caused in the original film. After a mutiny, he and a few companions are left behind on Skull island, where they meet a smaller relative of King Kong and make friends with him. It wasn’t until the 1970’s when the remake of King Kong with film stars Jeff Bridges and Jessica Lange came to the silver screen. Although the film carried the same title, the actual storyline was somewhat different from the original 1933 film. This time, the owner of the oil company Petrox Corporation, Fred Wilson played by Charles Grodin, invests all his possessions searching oil in an unexplored island. The vessel leaves Surubaya, in Indonesia, with the stowaway Jack Prescott, who wants to protect an ape called Kong. While travelling, they come across a castaway called Dwan played by Jessica Lange. Upon arriving at the mysterious island, they find that the island is inhabited and the local natives worship a huge gorilla called Kong. Using Dwan as bait, they capture the monster and take him to New York for exhibition. But during the opening night, King Kong escapes and brings panic to the city. Rather than climbing up the Empire State Building, this version opts for the gorilla to climb one of the World Trade Center towers, where eventually he falls to his death. Ten years later, King Kong makes a return the big screen with cinema audiences told that the giant ape has been in a coma for the last 10 years and now desperately needs a blood transfusion in order to have an artificial heart implanted. Starring Linda Hamilton and Brian Kerwin, this would be sequel, entitled King Kong Lives, received mostly negative reviews... I wonder why? Which brings us up to the Peter Jackson version. Released in 2005, and probably shot in New Zealand in between one of the many Lord of the Rings films, this version uses all the latest blue screen technologies to recreate a more believable Kong. Unlike any of the other films, the storyline stays true to the original film. Set in the 1930s, the young and beautiful actress Ann Darrow played this time by Naomi Watts finds herself lost in depression-era New York. The opening sequence is truly breathtaking as audiences are given a whirlwind tour of 1930’s New York, combining live action with computer-generated scenery. After a chance meeting with over-ambitious filmmaker Carl Denham, she agrees to go on an exploratory expedition to a remote island where she finds compassion and the true meaning of humanity with an ape called Kong. The beauty and the beast finally meet their fate back in the city of New York where the filmmaker takes and displays the ape in quest of his fame by commercial exploitation which ultimately leads to catastrophe for everyone including playwright Jack Driscoll who falls in love with Ann and plays an unlikely hero by trying to save her from Kong and her destiny. So, which version is the best? It is difficult to know what cinema audiences in the 1930’s would have thought of the breakthrough special effects of a plaster scene Kong coming to life in front of their eyes, even if it was shot in black and white. The technology was certainly ahead of its time, especially if you consider Aardman Animations still use the same type of technology when making the Wallace and Gromit short films. The apparent size of Kong actually changes from 18 feet to 24 feet. This was a conscious decision of director Merian C. Cooper, who felt that Kong's size wasn't impressive enough in New York. The publicity materials would later state Kong's height was 60 feet, almost 3 times the average height as he is actually depicted in the film. In 2009, the model of King Kong used in the film sold at auction for about $203,000. It was originally covered in cotton, rubber, liquid latex and rabbit fur, although most of the covering had decomposed. As with all films, there are the usual errors in geography and the original version is no exception to this. 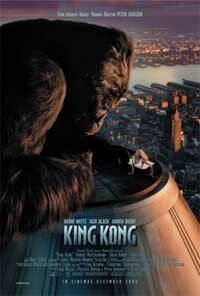 In the wide shot of Kong climbing the Empire State Building, he is climbing the western face of the structure. The financial district is visible to the south in the background. The shot of him atop the tower shows the Chrysler Building directly behind him. That building being to the Empire State Building’s north east, that puts Kong on the southern face of the building. When he falls, in the closer shot, he falls back to the south east. Back in the wide shot, he falls off the western side. Actual close-up footage of the Empire State Building was added to the film when it was re-issued in 1952 for the scene where Kong grabs the first plane and tosses it off the side of the building. We see a pristine picture of the Empire State Building as it existed in the 1950s with its TV antenna. In the other scenes the landmark building was part of "Hollywood Set", with archival aerial footage of the New York City skyline added. Consequently, the only actual "on-location" filming was done 19 years after the film's first release. Film processing improved by that time, and the difference in clarity between the 1933 footage and the added 1952 shot is quite evident. Originally, there was supposed to be an overhead shot of Kong falling from the Empire State Building. This was accomplished by adding Kong in post-production, falling towards the ground. 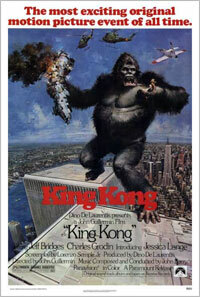 Real footage of the building was used, but when the producers watched the scene they realised that viewers could see through Kong, especially as he passed the darker ledges, so it was cut. Close-ups of the pilots and gunners of the planes that attack Kong were shot in the studio with mock-up planes. Comparing the 1933 version to the 2005 in an attempt to find an answer to our question is surprisingly difficult. Should special effects and live action sway the result? In today’s filmmaking, computer technology plays just as an important role as the leading characters, but what really counts is the story telling. Peter Jackson took 187 minutes to tell the story whereas the original only took 100 minutes. Should this be a factor in the decision making? Or perhaps the acting skills of the actors helping to tell the story. No, what it really comes down to is the story itself and with this in mind, you have to salute the 1933 version. Without this version, there wouldn't have been the remakes or the sequels and in conclusion... It wasn't the airplanes. It was beauty killed the beast.